The end of a star's life can occur in a tranquil manner in the case of low mass stars, such as the Sun. This is not the case, however, for very massive stars, which suffer such extreme explosive events that they can outshine the brightness of the whole galaxy that hosts them. 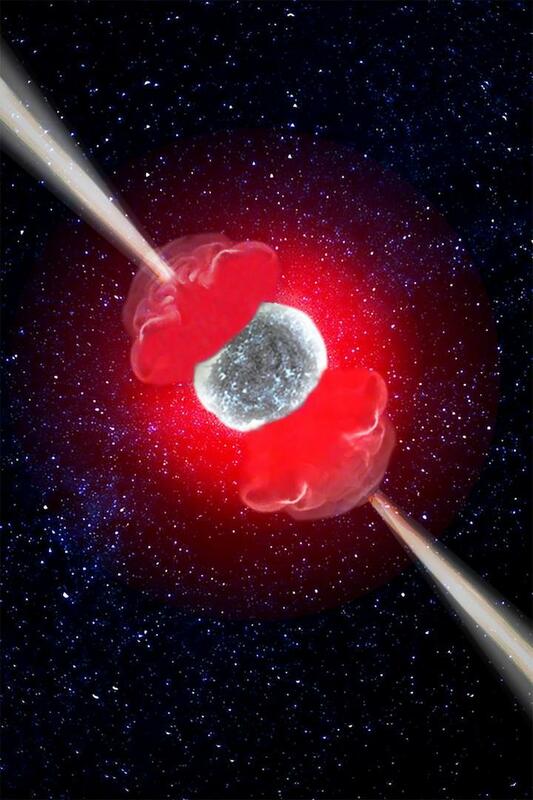 An international group of astronomers has published a detailed study of the death of a high-mass star that produced a gamma-ray burst (GRB) and a hypernova, in which they have detected a new component in this type of events. The study, published in Nature, provides a link that completes the scenario that relates hypernovae with GRBs. "The first hypernova was detected in 1998 as a very energetic type of supernova that followed a gamma-ray burst. This was the first evidence of the connection between both phenomena" says Luca Izzo, researcher at the Institute of Astrophysics of Andalusia (IAA-CSIC), and leader the study. Although the connection between GRBs and hypernovae has been well established over the last 20 years, the opposite is not so clear, since there have been several hypernovae that do not have associated GRBs. "This work has allowed us to find the missing link between these two types of hypernova through the detection of an additional component: A sort of hot cocoon generated around the jet, as it propagates through the outer layers of the progenitor star - indicates Dr. Izzo (IAA-CSIC) -. The jet transfers a significant part of its energy to the cocoon and, if it manages to reach the surface of the star, will produce the gamma-ray emission that we know as a GRB". On December 5, 2017, GRB 171205A was detected in a galaxy located 500 million light years from Earth. However far this may seem, this makes it the fourth closest long GRB ever observed. "Such events occur on average every ten years, so we immediately started an intense observing campaign to observe the emerging hypernova from the very early phases on - says Christina Thöne, researcher at the Institute of Astrophysics of Andalusia (IAA-CSIC) who participated in the discovery -. In fact, with our early observations we managed to obtain the earliest detection of a hypernova to date, less than one day after the collapse of the star". And indeed, very early on the first features of a hypernova were detected with the Gran Telescopio Canarias, on the island of La Palma. "This was only possible because the luminosity of the jet was much weaker than usual, as typically the jets outshine the hypernova during the first week - says Antonio de Ugarte Postigo, researcher at the Institute of Astrophysics of Andalusia (IAA-CSIC) who participated in the paper -. What we saw, however, was a very peculiar component, which showed unprecedented expansion velocities and chemical abundances that were different to the ones seen in similar events". The total energy emitted by the cocoon during these first days was larger than that of the GRB, implying that the jet transferred a large part of its energy to the cocoon. However, it also indicates that the energy of the GRB depends to some degree on the interaction between the jet and the stellar material, and on this new component, the cocoon. This discovery also implies that the models must be revised: "While in the standard model of supernovae the collapse of the nucleus leads to quasi-spherical explosions, the evidence of such an energetic emission produced by the cocoon suggests that the jet plays an important role in core-collapse supernovae which means we will need to consider it in supernova explosion models", concludes Izzo (IAA-CSIC).